In 1918 and 1919, a terrible outbreak of influenza occurred, which traversed the globe and killed between 50 and 100 million people worldwide. The Great Influenza of 1918 or the Great Pandemic began its extremely lethal Second Wave from the Port of Boston. The United States mobilized for World War I during 1917. Encampments were quickly set up throughout the country, supported by a limited number of hospitals, doctors, and nurses. Fighting men from east and west, north and south, farm and city with varying immunity to diseases were placed together in tight quarters in these training camps. A wave of influenza had occurred in early 1918, which became more virulent on a trip from the United States to France and then back to the United States. 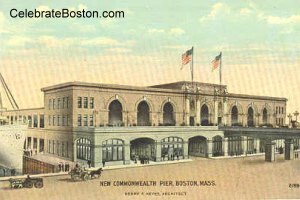 It started on August 27, 1918 at Commonwealth Pier in Boston. Sailors fell ill and were sent to the local Chelsea Naval Hospital. At about the same time, ships departed for Philadelphia and New Orleans, transmitting the deadly virus. The flu also quickly spread to nearby Camp Devens in central Massachusetts, devastating the population of soldiers there. At the height of the epidemic at Devens, about 100 soldiers were dying per day. In September 1918, the constant transfer of troops spread the deadly disease throughout the United States, and then to many parts of the globe. The civilian population was also quickly infected with the flu because of large public mobilization parades, and then later victory parades. The death toll in Boston was horrific, with schools and draft boards temporarily closed to decrease public gatherings, and even retail stores reduced their business hours to accomplish the same goal. Congestion in the subways was a significant cause of the spread of the airborne virus. As vehicle operators were stricken ill, service was presumably reduced, which caused even greater congestion in the Boston Elevated Railway transit network. According to the October 11, 1918 Boston Globe, 3,147 people died of influenza or pneumonia in Boston between the dates of September 14 and October 10. The peak in terms of loss of life was October 1, 1918, when 202 died on that day alone. About 195,000 Americans died of influenza or its complication during the month of October, 1918. Tens of millions were struck down worldwide in total. Great lessons were learned by public health officials—from not mixing diverse populations to effective quarantine procedures—which have greatly reduced the likelihood of a flu outbreak of this scale ever again.